“But we must get over the mountain before the children awake,” said all the dolls and the toys. The little engine looked up and saw the tears in the dolls’ eyes. And she thought of the good little boys and girls on the other side of the mountain who would not have any toys or good food unless she helped. 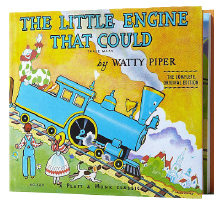 These words from the beloved, “The Little Engine That Could” by Watty Piper, helped me preach the gospel recently at a facility dedicated to caring for those with Alzheimer’s disease and other cognitive affecting diseases. As I read the story, after quoting one line of scripture, “I can do all things through him who loved us,” I witnessed a miracle (perhaps small to some, but huge to those of us who were there). The Gospel had been heard, most especially by me. We knew, at least for the moment, that life can be embraced, no mountain is too high if we remember God is with us. The takeaway, for all who care for and about older adults, is there are ways to reach all people with God’s word of hope. Experiment! Take chances! For in truth, we never know how God will be experienced. Don’t be afraid to challenge such folk with the Gospel and their ability to cope with life, using whatever tool might help achieve the goal. Remind them that “nothing in all creation” will be able to separate them from the love of God in Jesus Christ. Remind them that they can make it over the mountain. And as caregivers so can we.